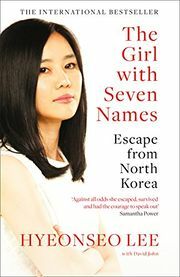 It started (or her old life ended) with Hyeonseo Lee doing a Ted Talk about her escape from North Korea, and her parlaying that into a book -- which details her accidental defecting to China, only to have the door home slammed shut. Then her parlaying that into a better life for her family. From her first realization that she could never go back, that if she went to South Korea, that she'd be used as a propaganda puppet against the North Korean regime... then she went there willingly, and has remade her life as a bit of an activist. It's really a good book though. I enjoy reading stories about people who've made a better life for themselves, and overcome adversity. And while she was a rich kid (by North Korean standards), she did see suffering of others, and is trying to better the world. She seems both guarded and brutally honest. Willing to lie to some she shouldn't, and tell the truth to others, that she shouldn't. Yet, she's very honest about the culture and shows her and its biases. People from different perspectives will get completely different lessons. But all get the opportunity to think about how humans who live in a cult, don't know any better, and build their world view from that perspective. How many are bad imagining how others might see the world. And realize, that everyone lives in a cult, of sorts -- though few as extreme and off kilter as North Korea. Being an abused kid, and learning that my life has never been "normal", I've always been fascinated by what other people's "normal" looks like. Especially, when their lives are not normal either. And I've heard far darker tales: from my Cambodian Sushi Chef, who told me his life's story of being kidnapped and forced to be part of the Khmer Rouge (and murder friends and family members), to someone in a Jacuzzi at the gym who I was sharing this story, and he shared his tale of being forced into an African Prisons with 4 cousins and a brother and was the only one to come out alive. Her journey is not a tragedy, but it's interesting getting to explore how she sees the world as a recovering North Korean, refugee of China, and second class citizen of South Korea. What this young and often naive girl learned through life, and is still out there making a difference in this world, and not just being one of the silent collective. It's definitely the best book I've read in 2018, but it's only the second week. Still, I expect it'll be a book that I remember fondly for the rest of my life. This page was last edited on 7 February 2019, at 03:10.